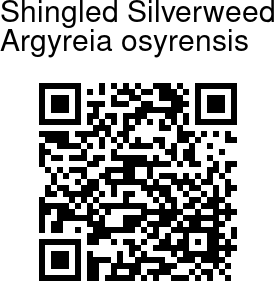 Shingled Silverweed is a climbing shrub with round stems, and axial parts densely whitish, gray, or yellowish velvety. Leaf-stalksa re 2-5 cm long. Leaves are ovate or broadly ovate to nearly circular, 4-12 X 4-10 cm, densely gray velvety, woolly, or hairy below, and hairy or somewhat hairless above. Base is heart-shaped, tip pointed or blunt, lateral veins 7-11 pairs. 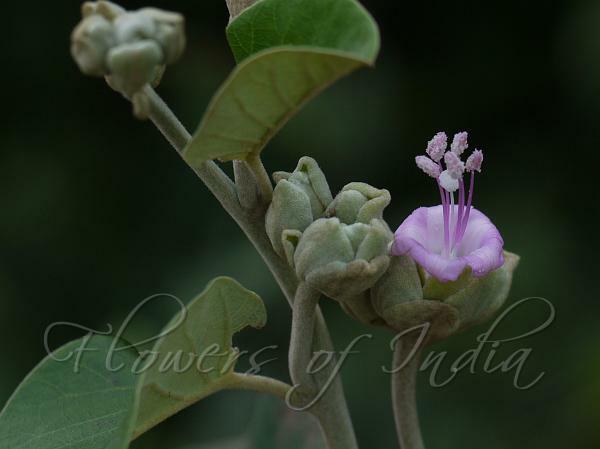 Flowers are borne in head-like clusters, carried on 2.5-6 cm long stalks. Bracts are persistent, broadly obovate, spoon-shaped, or circular, 0.8-1.2 cm, velvety below, tip blunt or flat. Flowers are stalkless or almost so. Sepals are unequal, velvety below, outer 2 obovate or spoon-shaped, 0.9-1 cm, tip blunt, inner 3 oblong, 5.5-8 mm, apex obtuse, hairless above. Fruiting sepals are enlarged, red, concave. Flowers are pink, tubular-bell-shaped, 1.2-1.5 cm. Limb is deeply 5-lobed into petals. Petals are narrowly ovate, emarginate, midpetaline bands pubescent. Stamens and pistil are protruding, filaments velvety basally. Berry is enclosed by sepals, red, round, 6-8 mm in diameter. Seeds are 1 or 2, globose, subglabrous. Photographed at Halabhavi near Belgaum, Karnataka.